Bond beaten Milkins in the final by scoreline of 58-24 but lost today by 15-30 within ten minutes. Milkins was the first man into the last 32 followed by World Number 2 Mark Williams, whose opponent was Steve Davis that has not scored a point as Williams made a break of 66, eventually winning 72-0. The next two matches to be played were among Scottish, both Stephen Maguire and Graeme Dott came from behind to beat Anthony McGill and Alan McManus respectively. Bingham also came through to beat China's Liu Song with a break of 66. Up next was the match of first round, John Higgins versus Judd Trump a repeat of World Final last year. Trump was favoured to win the match, leading 16-0 before missing the black off its spot to hand over a chance to Higgins. Runs of 33, 14 and 15 put Higgins to win 62-16.Gerard Greene was nearly edged out of the competition by Jamie Burnett but won by 9 points, 36-27. Ken Doherty defeated Michael Holt by 58-6 while Matthew Stevens sent Ali Carter home by 60-22. Tom Ford won a close match against Jimmy Robertson, 50-44. World Number 1 Mark Selby eased off Joe Perry by 104-1 while Rory McLeod, the winner of Magic Moment of the Year fluking the black to beat Tony Drago here would not have a chance to demonstrate it again. 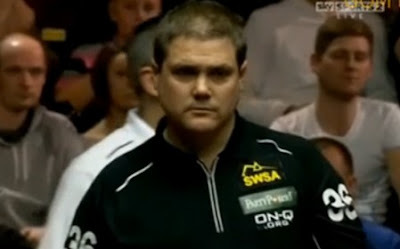 He was beaten by Mark Allen by 46-19. Martin Gould won against Peter Ebdon by 62-46 though Ebdon dominated with 44-8 in the first 5 minutes. Anthony Hamilton sent crowd's favourite Jimmy White with 66 and he nearly missed out the match, as he got stopped by the police while driving up the M1 and his car is now in a compound. Mark Davis had a comfortable win against Mark Joyce by 78-16. Stephen Lee was the last man today to through to the last 32 after beating Peter Lines by 60-37.